A divorce settlement agreement template is an easy to use legally binding document between two individuals who are going through the divorce process. The purpose of the document is to state in writing how the assets and debts will be split. It may also address topics such as child custody or visitation. Divorce settlement agreement forms are state specific. This means that they must comply with the divorce laws in the state where the divorce takes place. Divorce settlement agreements must also be approved by the judge overseeing the divorce. A divorce settlement agreement is used by a couple who knows they will be filing for or who have already filed for divorce. This agreement covers the distribution of the couple's assets, including property, bank account balances, and debts. It could also include suggestions for child custody and spousal support. The agreement is a legal document that provides the stipulations of the agreement in writing so that both parties can completely understand the terms. The agreement should be filed before the final judgment, when the divorce will be completely finalized. 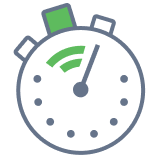 A properly completed divorce settlement agreement can help the proceeding move more quickly and reduce the amount of time spent in court. When Do You Need a Divorce Agreement? You should use a divorce agreement if you’re getting a divorce. While divorce is not an easy process, a divorce settlement agreement can make the process faster and easier. This is because the parties to the divorce can document how they agree to handle assets, liabilities, support, and custody and / or visitation of minor children shared by the couple. You know how to contact your soon-to-be ex-spouse. You and your spouse agree as to how assets and liabilities will be divided. If you have minor children and the two of you agree on child support and custody, you can also use this document. Your spouse agrees to negotiate with you on how to split the assets and liabilities. If you have minor children, your spouse agrees to negotiate with you in regards to custody and visitation. Child support is a federal matter. While you may both suggest an agreed upon amount or even no support, the judge may still order that child support be paid. You plan to meet with a lawyer with your spouse for a collaborative divorce (meaning that you both want the divorce and you’re working together to take care of it) and you want to show the lawyer what the two of you would like to do with assets and liabilities. 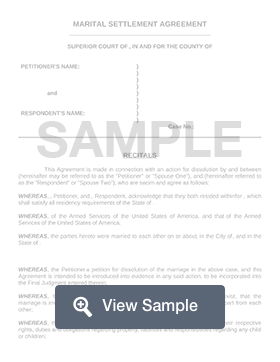 Create a free Divorce Settlement Agreement in minutes with our professional document builder. If the parties cannot use a divorce settlement agreement (or simply cannot agree on the terms of one), it will be up to the judge to determine, by state law, how assets and liabilities will be divided. Custody, child support, visitation, and even spousal support will also be left to the judge. Both parties must be ready to argue why they think they should receive what they want. This isn’t necessarily an easy process. In fact, it could backfire on you. Another consequence of not using a divorce settlement agreement is a potential increase of time and money spent on the divorce process. If the two of you can’t agree, you could both spend far more time and money on getting the matter squared away. An identifying title for the document. Identifying information of the spouses, their lawyers, any minor children, and any person who is appointed to represent the best interest of the children. A statement that the parties are getting a divorce and the reason why the divorce is being filed (even if it is a no-fault divorce). Identify the property (or assets) that need to be divided as well as how it will be divided. Keep in mind that this may largely depend on whether you’re in a community property state. Additionally, inheritances and other assets that seem to belong to just one of the spouses may also be affected by the divorce under state law or because of how the two of your decide to divide the assets. How child custody, visitation / parenting time, and child support will be addressed. The amount of spousal support, if any, that will be paid and for how long it will be paid. It may also state under what conditions. For example, until the other spouse remarries or for six months. The jurisdiction (county and state) where the divorce will occur. A clear explanation of how everything will be divided, any necessary forms such as a special warranty deed or quitclaim deed, and the date by which the distribution should be completed. A signature line and date for the involved parties and their attorney(s). Make sure you have all of the basic information and divorce forms you need according to the divorce laws in your state. If you plan to file for divorce without a lawyer, you can usually find divorce forms on the website of the county clerk or a link to a legal aid website that may also have copies of the right forms. You may even be able to find an outline of a divorce settlement agreement that you can use. If you are hiring a divorce attorney, they will help you draft the divorce settlement agreement. Make sure you have all of the personal information you need. You’ll need certain information for you, the other party, and any minor children that are shared between the two of you. You’ll need to list the date that you were married and where you were married. You should also list the date that the separation occurred. List the reason for the divorce, such as irreconcilable differences and that you and your spouse have lived “separate and apart” for whatever amount of time the two of you haven’t been together. You’ll need to list the home address for each party and for any shared minor children. Include a statement that you and the other party are in agreement with the contents of the document. This is important because it will inform the court that the two of you consent to the divorce and that you both agree as to how the assets and liabilities will be split as well as parenting time for shared minor children. Your signatures will likely need to be witnessed by a notary when you both sign the document. Make a list of the marital assets and liabilities and how the two of you plan to divide them. Keep in mind that you should know whether your state is a community property state. Both assets and liabilities can be joint or separate property. The rule of things is that anything that was acquired (regardless of whether it was a debt or an asset) before the marriage is separate. Anything (regardless of whether it was a debt or an asset) obtained during the marriage may be considered marital property even if only one spouse was involved. That is, of course, oversimplifying the matter. It is very important that you understand how liabilities and assets in your state are treated during a divorce. You will make a list of both assets and liabilities and explain who will take possession of those items. You should also list which items the two of you plan to sell so that you can split the proceeds. For items like cars, boats, homes, and other physical items that are in the names of both parties and that aren’t paid off, one spouse may take possession but also may need to have the item refinanced into only their name. This is the part of creating a divorce settlement agreement that may cause the most problems between the parties. If the two of you absolutely cannot agree or cannot get along, you may need to hire a family law lawyer to help facilitate communication and to help you complete the process. Carefully and calmly discuss co-parenting, custody, parenting time or visitation, and child support. If the two of you share minor children, you must carefully and calmly discuss co-parenting, custody, parenting time or visitation, as well as child support. You and the other party must remember that the court will ultimately make decisions if the two of you cannot. The court can even appoint a lawyer to represent the best interest of the children. That is an expense the two of you will be expected to pay. Child custody may be joint physical and legal (where both parents share both physical and legal custody), primary custody (where the children primarily live with one parent and visit the other parent; the other parent may or may not have equal legal custody with the physical custodian), or sole custody (where one parent retains both legal and physical custody). Child support depends on many factors including income of both parents, healthcare expenses, extracurricular expenses, daycare expenses, and how much time the child spends with each parent. You and the other parent may agree on an amount to be paid or no child support. Ultimately, the judge will agree or set the amount of child support as well as who will receive it. If you choose primary or sole custody, it is imperative that you outline visitation or parenting time. Most states have standard and liberal visitation schedules that you may consult. Alimony or spousal support. Not every couple will need to use alimony or spousal support. If it is a factor for your divorce, make sure that you explain how much will be paid, to whom, and for how long. If there is no alimony that will be paid, you should state that alimony is waived by the parties. Review the document before you sign it. Both parties should read over the divorce settlement agreement before signing it. Look for mistakes of any kind, including a typo or an error. Even small typos can cause a problem in court. You could hire a family law firm and have them review the agreement for errors and to make sure that it is fair to you before you sign it. Because divorce is a legal process and because a divorce settlement agreement is legally binding, it’s important that you consider the answers to the following questions. From a technical standpoint, the answer is no. You can represent yourself in any legal proceeding, including separation and divorce. The same can be said for a divorce settlement agreement. You don’t technically need an attorney. With that being said, though, an attorney can help make sure that (a) you’re treated fairly during the divorce process and in the settlement agreement and (b) that you’re protected as a parent. The court does not look solely at the gender of a parent when making a decision on custody. They consider the best interest of the child. A lawyer can also help you avoid fights with your former partner by speaking with them on your behalf. They can also represent you during the divorce process. Do I Need to Enter into an Agreement Before Separating? No, you do not need to enter into an agreement before separating. In fact, if you’re leaving at a time that is emotionally volatile for either or both of you, it may be better to wait a few days before you talk about a settlement agreement. Sometimes, you can’t reach a settlement agreement before you file for divorce. There are times where couples do not finalize their agreement until the day of their divorce hearing. Yet, the sooner that you and the other party can come to an agreement, the easier and less expensive the divorce process will be. What If We Settle Everything Before Court? That’s great! If you both settle everything before court, you may be able to simply present the agreement to the judge who will make sure that the terms are relatively fair. It will then be made part of the divorce decree. Can I Write My Own Agreement? Sure, but it’s important to make sure that your agreement complies with state law. There are some drawbacks to writing your own. You could accidentally miss an important provision. You could forget to add in certain assets or liabilities. It may not be clear enough to prevent misunderstandings. If you do write your own, it is a good idea to have it reviewed by a lawyer for clarity, to ensure legality, and to make sure that you haven’t missed anything. Can We Modify Our Divorce Agreement? Yes, but it isn’t necessarily easy to do. Once the two of you agree on the settlement and it becomes part of the divorce decree, it can only be changed through a modification agreement. You must both agree to the change being made. If you don’t both agree, the divorce decree will not be modified.